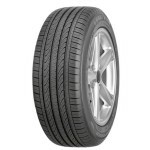 The Goodyear Assurance TripleMax 2 is a premium tyre that is made available in a variety of rim sizes right from entry-level hatchback to luxury saloon. The high precision technology used in the Assurance TripleMax 2 tyre allows better braking performance on wet roads and more comfortable drive. The innovative asymmetric tread design helps in better handling on the highways and superior manoeuvre under city conditions. During a wet braking benchmark test, Goodyear Assurance TripleMax 2 provided shorter wet braking distance in comparison to four other leading brands. The second generation Goodyear Assurance TripleMax comes in multifarious sizes to fit in a wide range of leading mid-passenger segment cars. The tyre comes as standard fitment to many well-known mid-segment cars. The Assurance TripleMax features new HydroTred technology, broader sidewalls, and many more attributes to ensure a safe and comfortable driving experience. More durable compared to its predecessors, Assurance TripleMax 2 presents premium quality at an affordable cost. Goodyear Assurance TripleMax 2 comes with new HydroTred technology, which assists in best in class performance compared to its rivals. The HydroTred feature uses boosted compound formulation, additional adhesive resin, and innovative asymmetric pattern design. It helps the tyre to provide outstanding braking performance under wet weather conditions. The tyre tread pattern comes with narrow shoulder grooves, more pitch numbers, and edges that absorb noise efficiently and offers a noise-free ride. The second iteration of Goodyear Assurance TripleMax ensures better resistance to impacts, thanks to the use of robust materials as well as improved sidewall construction. Unique compound ensures increased life expectancy while low rolling resistance gets you better fuel mileage.